A major recall has been issued by toy giant Mattel this week, involving more than 10 million Fisher Price brand tricycles, toys and high chairs over safety concerns. Mattel is voluntarily recalling the affected products in the U.S. and Canada, according to the U.S. Consumer Product Safety Commission and Health Canada. The products in question are being recalled after reports of children being hurt. Six required medical attention. 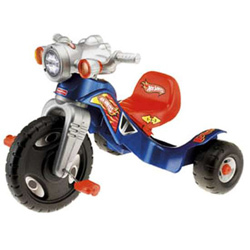 The trikes have a disc-shaped or D-shaped pretend plastic ignition key that sticks out of the trike, about 7cm (3 inches) in front of the seat. Children can sit or fall on the key, leading to injuries that the commission said can include genital bleeding. Fisher-Price is also recalling more than one million Healthy Care, Easy Clean and Close to Me High Chairs, after 14 reports of problems. Seven children needed stitches, the commission said. Also included in the recall are about 100,000 Fisher-Price Little People Wheelies Stand 'n Play Rampway toys. The wheels on the purple and green cars can come off, posing a choking hazard. More than 2.8 million Baby Playzone Crawl & Cruise Playground toys. Baby Playzone Crawl & Slide Arcade toys. Baby Gymtastics Play Wall toys. Ocean Wonders Kick & Crawl Aquarium toys. 1-2-3 Tetherball toys and Bat & Score Goal toys. Consumers are advised by Health Canada to immediately remove affected products and keep them away from children. Parents who have purchased affected items may contact Fisher-Price for a free replacement kit. For more information, consumers may visit the Health Canada Recalls website or contact Fisher-Price at 1-800-432-5437 between 9AM and 6PM ET Monday through Friday or visit the Fisher-Price website.